Another round of the National Trophy last weekend, over in York. A great venue for racing and, during previous races I’ve done there, a good course. I was looking forward to it. I headed over on Saturday to have a look at what was in store and to cheer on the NWCCA riders in the vets races. The ground seemed greasy but firm, with the off cambers still totally rideable with a bit of finesse. A few practice laps after the racing had finished confirmed that I’d be better swapping to gripper but slower rolling tyres ( I was doing a lot of ‘sideways steering’ which, while fun, wasn’t exactly fast). The drive over on Sunday was done in heavy rain. I knew what that would mean for the course. Those greasy but firm cambers would be muddy, ruined grovels by the time I got to race on them. The already sloppy, running section at the ‘back’ of the course would be like something from a Somme based war movie. Bugger. I didn’t bother doing any pre race riding on the course. I knew it would just knacker the bike, get me covered in mud and just make me grumpy! Instead I wandered back to the van, past a Belgian lad warming up, in his own gazebo, with is name all over it, stuck up next to his huge van with a picture of him on the back of it, proudly smiling away in his team kit, surrounded by sponsors logos.You don’t really get that at the NW races. It was slightly off putting. Anyway, I sat i the back of the van screwing in the longest toe studs I had to the race shoes, pinning the unlucky race number “13” I’d been given onto my jersey upside down – as is the unwritten (until just then) rule to avoid bad luck – while reminding myself I was lucky enough to have Dave and Paul already stood in the pits with my spare bike, ready to spend hours getting cold, wet and muddy just so I could race. Yeah. Where are my toe studs .. The race itself went, well, awfully. I had no appetite to ‘get stuck in’ during the start sprint. I didn’t trust the off road tyres on the tarmac (covered in a fine sheen of mud) while riders around me were flailing from side to side. I must have been very near the back by the first bottleneck and could see the leaders already the best part 30 seconds up. I know you should always keep optimistic while racing, but I already knew I’d be getting pulled out early. A few mistakes here and there on the rest of the first and 2nd laps meant the gaps to the fast lads just opened up massively. I was wasting time fighting my way through the tail end and not making overtaking moves stick because I was angry with how badly it was going. Although I eventually settled in a bit – and even started to enjoy it (thanks to everyone cheering me on, it definitely stopped the mid race sulking!) – I did end up getting removed from the race before the end. I missed the cut by just a few seconds, which was even more galling given how badly I’d ridden. If I’d just got my lines learned a bit, ridden a bit more assertively (I’m not the greatest skills wise, but I’m far better than I was showing o the technical sections), maybe I could have carried on regaining places at the end of the race. As it was I finished in a lowly 35th. A bit dejected. 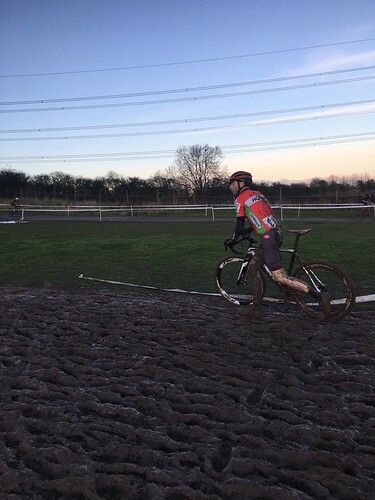 I decided to blame my race number, which was still visible through the mud and nearly got me in trouble with a commissaire who said he couldn’t read it and that I shouldn’t have had it on upside down. I was in no mood to make my “it’s the right way up every time I crash” joke, so I just stomped off to apologise to Dave and Paul for sort of wasting their afternoon. I think the next National Trophy I’ll be doing is the Shrewsbury round (the others are way too far to travel! ), hopefully I’ll get back further up the field again there!